Are Americans suffering from financial-decision fatigue? After the relative calm of rising financial markets though the 1980s and 1990s, Americans have lived through a series of booms and busts. First came the Internet boom of the late 1990s, which busted. Then the real estate market took off just as “emerging markets” plummeted. That was only a prelude to the worst financial-market collapse since the Great Depression. The stock market is now bouncing around like a bungee jumper. Roiling markets in recent years have spurred decision after decision – about retirement, home buying, downsizing, mortgage refinancing, spending on large purchases such as a car, and where to find a good job. Investors are advised to stick with a long-term plan and not react to every market fluctuation. In reality, there’s a history of research showing that dramatic gains and losses do cause people to change their behavior. Many Americans decided to abandon the stock market after the 2008-2009 decline, which pummeled 401(k) balances. A centuries-old trend of retiring at an earlier and earlier age has completely reversed, concluded a July report by the TIAA-CREF Institute. In 1910, men didn’t retire until they were about 73 but that dropped to age 63 by the mid-1980s, the golden era for generous union- and employer-sponsored pension plans. Then the retirement age and labor force participation ages started heading back up, according to TIAA-CREF’s report, “Early Retirement: The Dawn of a New Era?” Women experienced a similar though less dramatic trend. The report provided numerous explanations for this, including the demise of the mandatory retirement age for most American workers; the improved health of older Americans; and technology that has created options about when and where they work. Many retirees go from full-time work to part-time “bridge” jobs. Stockbrokers and financial advisors typically focus on the mechanics of investing – the dividend, the strategy, or past performance. When they do, investors often become overwhelmed by the conversation. To break through that and improve their comfort level, investors should instead focus on the more important issue at hand: the credentials and character of the person peddling those investments, said Tamar Frankel, a law professor at Boston University. “I want to shift the focus from what is being sold to who sells it,” she said. An expert in financial regulation and fiduciary law, Frankel’s latest research examines the role of trust in various professional relationships, including the relationship between a broker or advisor and his or her client or potential client. Frankel’s basic premise is that no question is a stupid question. Since brokers and investment advisors are not regulated by the same fiduciary standards that govern, say, employer pension funds, investors must protect themselves. That can be difficult to do when the broker is throwing around unfamiliar terms. She recommends investors come armed – with questions – to their meetings with brokers. She has put together a deceptively simple list of questions. If the broker refuses to answer a question – his or her right – then the investor has already learned something important. Here are three of Frankel’s 15 questions and her thinking behind them. The impact of today’s purchasing decisions on how much money you’ll have years from now, in retirement, can be abstract. Putnam Investments’ new iPhone app does the math for you. This Putnam video uses the example of an HDTV that costs $1,738: save that money instead and earn an additional $44.18 per month in retirement. That’s enough for a dash to the grocery store or an evening at the movies. Putnam’s senior Web executive, David Nguyen, called it a “smart app,” because it allows users to tailor the assumptions that drive the calculations. For example, the app takes into account the user’s age, and it assumes the money not spent will earn investment income until you’re 65 years old (that targeted retirement age can also be changed). The investment returns mirror the individual returns for each user’s asset allocation. Phone apps are proliferating, and there are lots of cool new ones for every financial need and age group, including children. Putnam’s app is pretty popular. The Boston mutual fund company said about 1,000 people have downloaded its new PriceCheck&Save application from Apple’s iPhone store since its June 6 release. Unfortunately, it’s available only to those whose 401(k)s are managed by Putnam, though the company is working on an unrestricted app. All the headlines about “financially illiterate” Americans miss something important. The language financial professionals use can be incomprehensible. No wonder people are confused by the “Finglish” – financial English – thrown around by their mutual-fund companies, 401(k) managers, and other investment professionals, Saylor said. NWNE Heard On The Street from Center for Retirement Research on Vimeo. With the Standard & Poor’s 500 stock index down 13 percent in three weeks, new research confirms what many people believe to be true: emotions drive investment decisions that can lead to costly mistakes. In a forthcoming paper in the Journal of Market Research, three business professors were able to show for the first time that an investor’s prior experience with buying and selling a company’s stock – not cold, hard analysis – is what determines whether he or she would repurchase that same stock at a later date. When the entire market plunges hundreds of points, as it has this week, the tendency to be led by one’s emotions is only magnified. The death of a husband is frightening and overwhelming. These feelings are magnified for women who relied on their husbands to handle the household finances. Florida financial planner Kathleen Rehl’s new book, “Moving Forward On Your Own: A Financial Guidebook for Widows,” gently guides widows through this daunting task. The author’s professional experience over the years has naturally “morphed” into her interest in helping her “widowed sisters,” through this book, she said. And her credentials are all relevant: Ph.D. in education, CFP certification, and recent widow. Her husband died of liver cancer in 2007, eleven weeks after his diagnosis. Here’s what I like about her award-winning book: my 75-year-old mother would like it. 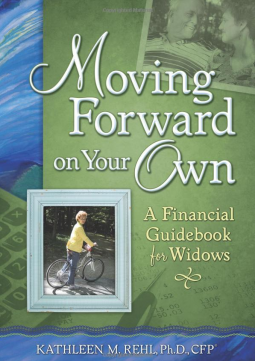 Rehl tries to make widows comfortable that keeping their emotional priorities straight is their top priority – allowing time to grieve, making an effort to plan activities with friends and grandchildren, and growing spiritually.